Edwin Thompson's timing was anything but lucky. He opened the Try-Me service station in 1929 right before the Great Depression would mark the end to the roaring twenties. In spite of the economic collapse, a belief in outstanding customer service made the business prosper. In 1936 Edmund started selling used cars and later that year he established himself as Baltimore Maryland's newest Willys dealer selling new cars. In 1937 he added Studebaker. In 1940 the business had grown so much that he razed the original service station and built a new building. Shortly after completion WWII brought new car production to a halt. He returned to his service station roots and was able to keep the company going through the duration of the war. He added Packard in 1954, and two of his sons joined the business. In 1956 the family would take a big step. Willys, Studebaker, and Packard, were becoming obsolete. They would drop all of their existing lines to become a Mercury dealer. The business prospered and in 1965 a third generation of Thompsons would join the business. When you bought a new Mercury chances are you were talking to a Thompson. In 1969 buying a new car was a big deal. The neighbors noticed. the guys at work noticed. Of course your mom and dad would notice and be pretty proud as well. Remember the intoxicating "new car smell"? Maybe that is what closed the deal one early March day in the spring of 1969. On Monday, March 3, 1969 Bob Jones visited Thompson Mercury and bought himself a brand new car, a Mercury Cougar. He must have been smiling from ear to ear, doing pretty good for himself at just 23 years old. He would take the new Merc home to 3004 Dunmurry in Baltimore Maryland. For the third year in a row, color code I, medium Lime Metallic (called Lime Frost in '67 and '68) was the most popular color for new Cougars. So it is no surprise that the color would grace Bob's new car. Inside the seats were Ivy Gold, again the most popular color of all, only these were upgraded to nicer Decor version, code 2G. Under the hood the new H code 351 2V would provide ample power, standard equipment in the Cougar but four steps up the Mustang option list. The new to Cougar FMX transmission would deliver the power to a 2.75 : 1 ratio open rear axle. Both the most common choices in 1969. The Cougar had been ordered for stock, having been built toward the end of November 1968, so Bob would have been able to take the new Cougar home as soon as the paper work was complete. Exactly how long Bob Jones kept the car is a mystery, but when it was time to part with it, it didn't go far. His sister became the next owner and she drove it cross country to Whidbey Island Washington where it would stay until 1991. The Cougars next home became Arizona. We can only guess why she decided to sell the Cougar but as an Arizonan I suspect that the lack of air conditioning might have something to do with it. The next owner would put only 600 miles on the car in 20 years time. 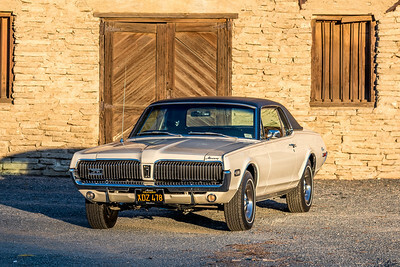 For 50 years the Medium Lime Metallic Cougar passed from one owner to another traveling through time some how escaping the elements and accidents. Frank Tressider lives in Peoria Arizona, a Phoenix suburb, with his very patient wife of 32 years. They have two grown children, two grandchildren and one Cougar. His job as a Superintendent for a large construction firm supports his Cougar habit. 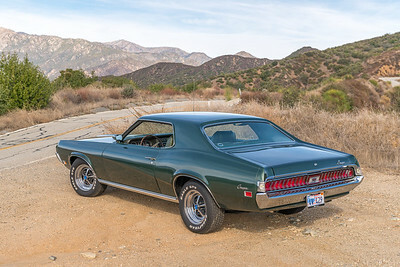 Although he had a strong automotive background including three years in High School auto shop classes, this is his first classic car and also his first Cougar. In 2010, Frank was looking for Mustangs, and turning up mostly examples that were either over priced or not worth looking at. Then he spotted the Cougar on Craigslist, not far from his home. When he went for a look he found a very complete and un-molested car that with a shot of starting fluid, would start and run. On a short test drive he learned the brakes were about as effective as a foot dragging on he ground. He told the owner he would need to think about it, and went home. The next week Frank got transferred to a project out-of-town and didn't think too much about the Cougar. Up on his return, a year later, he decided to contact the owner to see if by chance he might still have the Cougar. He gave him a call, and the Cougar was still for sale. The next day he bought it. Fortunately the Cougar was only a few miles from his home. The intervening year had done nothing to improve the brakes. On the drive home he followed his wife driving their truck; if he was going to hit another vehicle it might as well be his own. Franks luck held and the Cougar arrived home safely. Frank tells us the REST of the story: "and then one day I got a wild hair and decided I was going to do a complete restoration, took it apart to pretty much the last nut/bolt. I had the entire car media blasted, had the machine work done on the motor, rebuilt the front suspension, did a disk brake swap on the front, and replaced all of the brake/fuel lines. I painted the underbody and engine compartment. I added AC by Classic Auto Air and a Rocketman Tach to the dash. The headlight doors got the electric motor treatment. Reitz Restorations in Avondale did the body/paint (fortunately there was very little rust and only one 4 inch square area with bondo on the tip of the passenger fender). Other than the body and paint I did everything else including several weekends polishing window, trunk, hood, and wheel well moldings." The results speak for themselves. Frank is particularly happy with the color and stance, and the way it sounds even at idle. Frank describes it this way: It's a very nice driver with enough punch to burn the tires through 1st and 2nd gears. The interior, except headliner and carpet, is all original, I also have the original owners manual with the date of delivery and signatures of the original owner and the salesman that sold him the car." As we all know, Cougar ownership is special. "I have attended quite a few shows and it is very interesting how many people will stop/look and talk about the relative/friend or themselves that have had a Cougar in the past. My son attends pretty much every show with me, and my Grandson (age 2) cant wait to go sit in the car whenever he is at the house." Frank's Cougar isn't super rare. In fact it is exactly the opposite, being almost a perfect example of what was most popular. However, it is the only Cougar in his garage and the only one that he personally restored, and that makes it a one-of-one in our book. Congratulations Frank. I may have looked at this car when it lived on Whidbey Island. I was living there at that time. Last edited by badcatt on 07 Feb 2019, 19:03, edited 1 time in total. Love it, beautiful cat. Surprised I have not seen it around Peoria since I’m a local Peoria resident as well. Congrats on the ROTM honors! Well-deserved! LOL, yes she is, congrats!